Throughout September, we are encouraging all of us to be brave with our lives. It is easy to stay in our comfort zones, feeling safe, secure and unchallenged in our daily lives. However, taking courageous steps to try new things, go on more adventures, push ourselves more, or take steps to challenge ourselves, can bring great rewards. The sense of achievement in succeeding in something we never thought possible, or the satisfaction of mastering a new skill or trying something different, is exciting, life-affirming, energising, and ultimately, inspiring. There is plenty of evidence that a feeling of self-mastery and achievement boosts your mental wellbeing, and transforms your outlook on life. At various points in our lives, we all face tough times, challenges and difficulties that can get on top of us and wear us down. But we all have deep wells of resilience within us that help us cope, and remind us how strong we really are. Taking small, brave actions throughout our lives builds this resilience for when we really need it. Capture and remember moments when you have done something or faced something that you were scared of, but did it anyway. Have a mantra – a phrase, or word, that captures that feeling for you - so you can bring the feeling of courage to mind when you need it. I like, ‘She who is brave is free’, as it reminds me that fear entraps us, and keeps us in a small, confined, seemingly safe, but ultimately restrictive, world; whereas courage sets us free. I personally don’t much like flying – it got so bad a few years ago, that I would spend half my holiday worrying about the flight home. But then I decided I didn’t want to be that person any more. I want to travel the world and see interesting places, so I simply wasn’t prepared to be the person who was scared of flying any more. So, how can we bring more courage and bravery to our lives? It could be by speaking out about something you feel strongly about; it could be standing up for someone else, or apologizing for something you have done. It could be taking steps to change your job, or to follow your dreams; it could be a physical challenge, like running a marathon or climbing the 3 peaks; it could be ending a relationship, or starting one. It could be public speaking, or dining out on your own; or simply being more open to new experiences when you are on holiday. Throughout September, find small occasions when you can be brave. Set a brave and courageous example to others – your children, your family, your work colleagues. Step out from your comfort zone, and try new things. Read our blogs about bravery, to feel inspired. 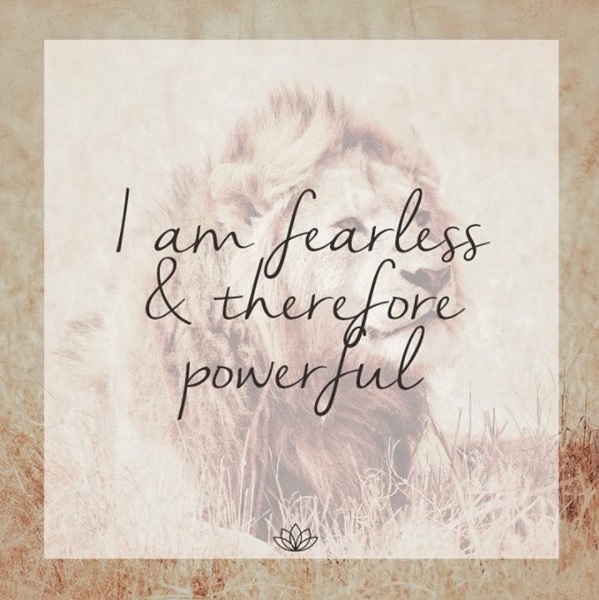 And create a mantra for yourself that brings to mind the feeling of achievement, when you have overcome your fear and done something in spite of being scared. Share your experiences with us on social media, and tag us at #mybestself to enter this month’s prize draw.